Top 3 Benefits to New Manufacturing Technology - SFA Inc.
People try out new technologies each day. The manufacturing industry is no exception. They buy new phones, lease new cars, upgrade the software on their phones and computers, or add implements to their homes to improve their quality of life. Embracing new technology is a move that would benefit the manufacturing shop floor industry most. 1 – You can keep up with the competition. According to recent results from the Manufacturers’ Outlook Survey, the National Association of Manufacturers states that in 2017, there is a record-high level of optimism in the manufacturing industry. 91.4 percent of manufacturers said they would increase investments, hire more workers, and that they generally feel good about our industry’s growth. Do you fit in this category? Are pieces of old tech, like floppy disk drives and handheld terminals holding you back? Are you experiencing communication failures due to lack of CNC memory for your programs? These are all problems that new technology can fix, so that you can get in on this wave of prosperity. 2 – Increase profit. When implementing new hardware and software into older machines, this can help drastically decrease downtime. When there is no downtime to deal with, or less of it, machinists are free to perfect their craft. According to SME, there have been proven studies that show on average, time will decrease 5 percent every time the number of completed pieces doubles. Therefore, if a machinist has more time to actually do their job than deal with machines going down, that will ultimately make the company more productive. Implementing machine monitoring to track machine trends increases OEE and DNC software can help with CNC communication failure, which are two sure fire ways to combat downtime. 3 – More freedom. When there is less worry of machines going down, this can create a better work/life balance for those who work on the shop floor, and in the front office. 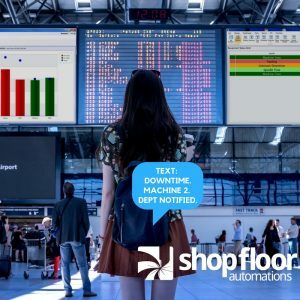 Machine monitoring, which is a powerful IIoT (industrial internet of things) tool, is an amazing way to get notifications of what is going on with machines not only on the shop floor, but via email or text notifications. When this proven solution to deal with downtime is combined with more accountability through the means of graphical job scheduling, PDM, and other resources on the shop floor, there is more trust in the workplace. More people can use their PTO to go on vacation, or workers who are home sick can help give guidance when a machine goes down via a notes section through machine monitoring. If you are interested in new technology for your shop floor and experiencing the benefits listed above, contact us by filling out a sales form here, or call (877) 611-5825.